Professor of Electrical and Computer Engineering Christopher Davis and Assistant Research Engineer John Rzasa (Ph.D. '13, M.S. '07, B.A. & B.S. '05), researchers with the University of Maryland’s Clark School of Engineering’s Department of Electrical and Computer Engineering, have partnered with J. Keith McElveen, President and Founder of Wave Sciences Corporation in South Carolina, to create a new video camera that excels in capturing video footage in greatly varying brightness conditions. Shooting video scenes that include brightly lit and dark elements in the same frame can be challenging. To avoid over- or under-saturation in the image, most HDR cameras take multiple sequential frames at different exposure levels and then composite them, revealing detail in previously unviewable parts of the scene. But this method causes the image to blur when capturing moving subjects, significantly lessening the image quality. Davis, Rzasa, and McElveen’s True High-Dynamic Range Single Lens Video Camera uses a single camera lens to record three images simultaneously that capture varying light profiles. By recording images in this manner, the blur is reduced significantly and the quality of the image is greatly increased. 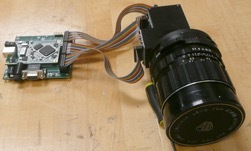 The team was inspired to invent a new kind of video camera after noticing that their regular cameras did not capture video footage of good quality in settings with uneven lighting. “We wanted to see more detail in scenes that were washed out in our normal cameras, but could not use traditional multi-exposure HDR because of the motion blurring problem,” said Rzasa. They also realized the importance of making the system easily adaptable, and designed it to work with existing parts. Now that they have a working prototype, they are seeking grants to continue developing the lens and plan to commercialize it. “We think it has a bright future in law enforcement, the military, television and film,” said Rzasa. To learn more about “30 Days of EnTERPreneurship,” visit: http://www.umd.edu/30Days/.